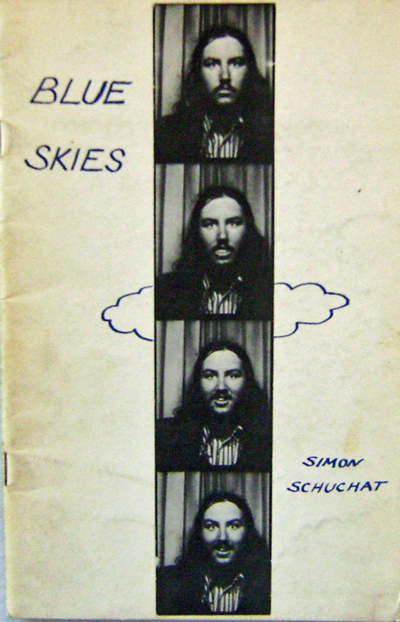 Simon Schuchat (1954 – ) was raised in DC, and made the acquaintance of Michael Lally and the Mass Transit poets at age 15, becoming the youngest author published by Some Of Us Press when his book, Blue Skies, was released in 1973. He attended the University of Chicago and published the journal Buffalo Stamps before moving to New York in 1975 and becoming part of the St. Mark’s downtown writing scene and becoming associated with the third generation of New York School poets. Schuchat was also directly involved in small press publishing; he edited the 432 Review and founded Caveman. His poetry titles include: At Baoshan (Coffee House Press, 1987), Light and Shadow (Vehicle Editions, 1977), and All Shook Up (Fido Productions (1977). From 1978 to 1981, he taught at Fudan University in Shanghai, then studied East Asian Studies at Yale and Harvard. He was a State Department Foreign Service Officer for over twenty-five years, from 1985 to 2011, serving in Beijing, Moscow, Tokyo, Hong Kong, and other places. He has translated poetry and prose from Mandarin and Russian into English, including works by Lu You and D.A. Prigov. His translation of Chinese poet Hai Zi’s verse play “Regicide” was recently published in Hong Kong.